A beautiful fall Sunday saw us journey out to the Snoqualmie Valley for a ride between Duvall, Carnation and Fall City. Parking at Tolt MacDonald Park in Carnation, we cycled north along the old Carnation farm road, which hugs the west edge of the valley, and crossed into Duvall. Fueling up at The Grange with a brunch of tasty homemade goodness, we then jumped on the unpaved Snoqualmie Valley Trail, which begins just north of downtown Duvall. We took the trail, which is suitable in dry weather for most types of bikes, except for those with very skinny tires, southbound through the valley, somewhat paralleling the area’s busiest road, State Route 203. Only a smattering of hikers, dog walkers and other cyclists met us along the way. The trail treated us to varied scenes of fall. Trees coated in brilliant yellow and orange were everywhere, from trailside to riverside to receding into colorful hillsides in the distance. We exited the trail at the well-marked crossroads for Fall City, enjoying a winding mile downhill to SE 39th Place, a side road on the south edge of Rutherford Slough that joins SR 203 at the roundabout into town. From Fall City we took the quiet farm roads back to Carnation, stopping at my favorite valley farm, Jubilee Farm, for their harvest celebration. With pumpkins in the panniers, we headed back to the car, shaving off the last mile into Carnation by cutting across NE Tolt Hill Road to take the rough but manageable half-mile trail to a pedestrian-bike bridge back into the park. Perhaps the weather will cooperate for you to enjoy this trail before the end of our glorious fall. I recommend it. Recent bridges and repairs along wetlands enhance riding and views. Trail surface is packed gravel or earth, suitable for road bikes with wider tires. Taking a break on a bridge to enjoy a river view. Moss-covered trees are trailside in one shady section near Fall City. The Grange Cafe in Duvall is the perfect place for brunch on a Snoqualmie Valley ride. These ornamental cabbages are grown for the flower market, but between them is a nice crop of edible arugula. Colorful dahlias, also grown for farmer’s markets. There’s a festival at harvest time at Jubilee Farm outside Carnation. My pannier fit one modest-sized pumpkin, plus a useful product from Rainy Day Bees, which had a table at the Jubilee Farm Harvest Festival. A heron watches for lunch in the Carnation Marsh. 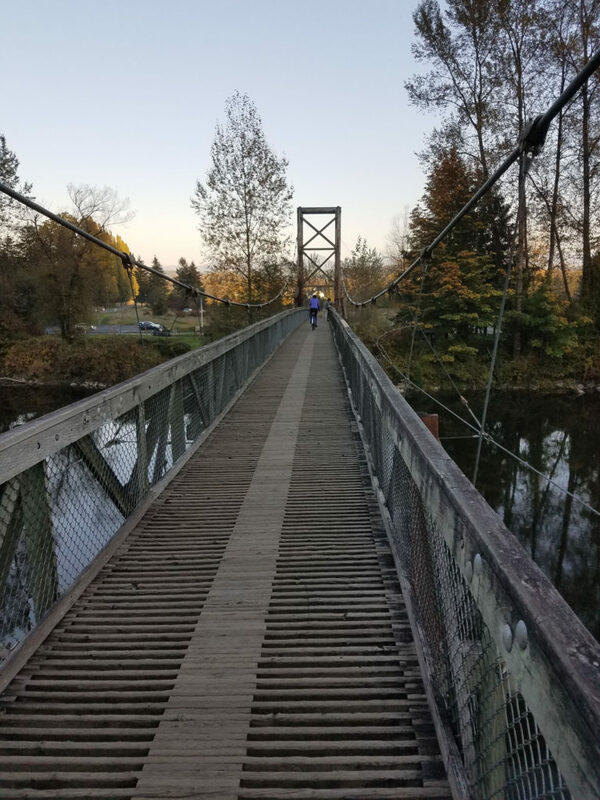 This bike-ped bridge over the Snoqualmie River lets you skip the road to get to Tolt MacDonald Park. However, the half-mile trail from the road is a bit rough with large, loose gravel.